List Rules Vote up the most awesome and mind-blowing photos taken from the International Space Station. Some of the most stunning images in existence are photos from the International Space Station. The coolest and most breathtaking ISS pictures are taken on handheld cameras operated by the astronauts. Consider the selfies possible at over 200 miles above Earth with nothing but some tethers to hold you down. Between work, school, friends, and updating social media it's easy to forget that we're spinning at 1,000 miles an hour on a small blue dot in the middle of an infinitely expansive chunk of Unknown. It frequently slips our minds. Luckily, we have astronauts and cameras to remind us just how far science - and humans - have come. Here are some of the most incredible pictures from the International Space Station to remind you of our place in whatever the universe even is. 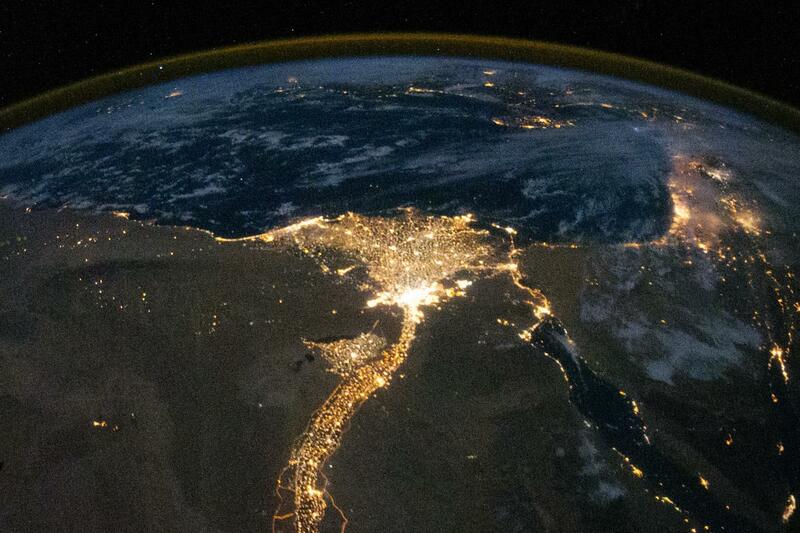 Here, the Nile, the world's largest river, is seen lit up from over 249 miles away on the Space Station. It's photos like these that inspire words like sonder: "n. the realization that each random passerby is living a life as vivid and complex as your own—populated with their own ambitions, friends, routines, worries and inherited craziness—an epic story that continues invisibly around you like an anthill sprawling deep underground, with elaborate passageways to thousands of other lives that you’ll never know existed, in which you might appear only once, as an extra sipping coffee in the background, as a blur of traffic passing on the highway, as a lighted window at dusk." ISS crew members see nighttime on Earth 16 times each crew day, from every orbital angle. This photo was taken over the Pacific Ocean, several miles south of Hawaii. Because scientists on Earth were able to determine the spacecraft's location, they took their predicted star patterns and the star patterns found in this photo and concluded that the angle of the photo was pointed toward the center of our Milky Way galaxy. There is an equatorial cloud layer keeping much of the ocean from view, but because of the location of Earth's curve, air glow layers (those colorful parts) are still visible. Mount Cleveland is an active volcano is Alaska's Aleutian Island Arc. While this photo, taken by astronaut Jeff Williams, is stunning, the volcano is actually a serious risk. The volcano has erupted several times since 2000 and poses a real threat to aircraft in particular. When the ash plumes make their way through the air, planes can experience damage to their exterior. If the ash makes its way into the jet engine, engine failure can also occur. The Great Barrier Reef, off the coast of Australia, is Earth's largest living feature. From here, it's hard to tell that the reef is made up of 2,900 individual reefs, or that it's home to over 1,500 fish species (and that doesn't even begin to count whales, or turtles, or ascidians)!